Global food prices are at an all-time high, U.S. gasoline prices are at the costliest level ever for this time of the year and yet inflation, in the words of Federal Reserve Chairman Ben Bernanke, remains "quite low." By official reckoning, that's certainly the case. On Thursday we'll get the latest monthly inflation figures in the form of the consumer price index, which, to the Fed chief's chagrin, is running too close to disinflationary levels. Economists, on average, expect January prices to increase at just a 0.3% rate. So-called core inflation, which excludes volatile food and energy prices, is forecast to rise just 0.1%. As Bernanke testified before Congress last week, economists exclude food and energy prices because that core inflation rate "can be a better predictor of where overall inflation is headed." By that measure, inflation was only 0.7% in 2010, compared with around 2.5% in 2007, the year before the recession began, the Fed chief explained. Too bad those numbers don't jibe with with most folks' experience at the gas pump or checkout counter. As economist Ed Yardeni, president of Yardeni Research, told clients Tuesday: "I share the growing concern among the Fed's critics that the official measures of consumer price inflation may be understating actual inflation and that excluding food and energy from these measures is OK as long as you don't eat or drive." 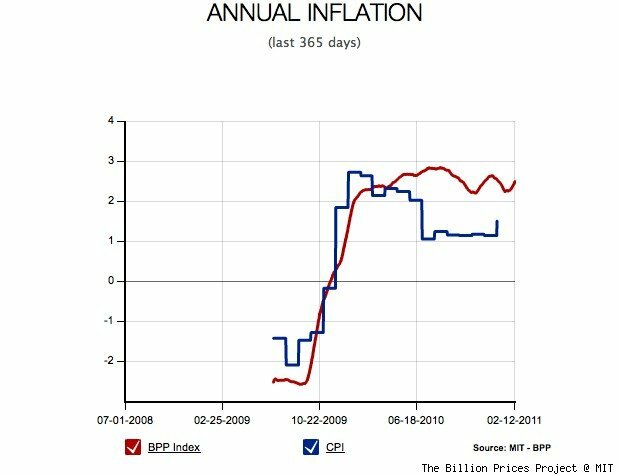 Alternative measures for inflation show a far more alarming picture of price increases than the official data suggest. One of the more intriguing approaches is The Billion Prices Project at the Massachusetts Institute of Technology, which collects daily price changes on about 5 million items sold by approximately 300 online retailers in more than 70 countries. For U.S. price data, MIT tracks 550,000 products from 53 retailers. By this measure, annual inflation is currently running at a rate of 2.5% -- or 66% greater than the official CPI figure. See the chart above. Core inflation may have run at just 0.7% in 2010, as Bernanke says, which is the lowest reading on record gong back to 1960. 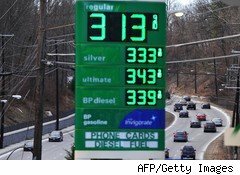 Even if you add back in those pesky food and energy prices, the number rises to 1.2% -- still no big deal. But by the Billion Prices Project's reading, inflation in 2010 more than doubled to 2.5%. "The Billion Prices Project @ MIT is finding plenty of evidence that consumer prices are rising faster than the official price data," Yardeni notes. Whatever the latest data show Thursday, there's a big difference between inflation as a guide for monetary policy and its real-world impact on conusmers' pocketbooks.